Each user in an organization can be assigned to different user roles and user rights. Through these roles can be regulated who can access the content and features of an organization or who is allowed to edit the settings. In addition to the role in the organization, rights groups can also be defined and assigned to users within the rooms. The role in the organization has no effect on the rights within a room, with the role External being an exception and the rights in the room being limited to commenting and reading of shared items. An administrator manages the settings and user of an organization. A member can be added to rooms and work in these. In addition, he can use all features of the organization. Your company's employees or team members are almost always added to Stackfield as members, so they can use all the essential features and see each other. A guest can be added to rooms and work in these, but has no access to the features of the organization. Recommended when working with external staff or freelancers. An external person sees in rooms only the manually shared elements and can comment on them. For this reason, this role is suitable for working with customers or freelancers who should support the project, but should not have access to all data. 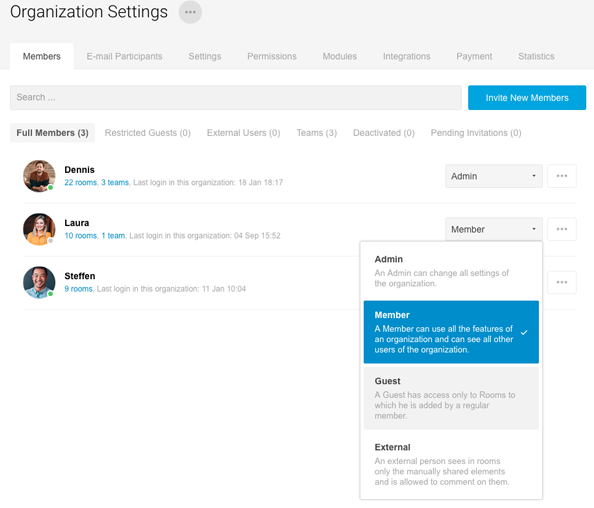 Within the settings of the organization you'll find an overview of all team members. This overview displays, besides the name and the statistics, the user role for each user. By clicking on the current role, you can change the role. The user role can be changed at any time.